Lighting is a key component of interior design; it creates an aesthetic touch in your homes surroundings based on where it is located and the type of light fixtures you use. The kind of lighting design used is also determined on the functionality and ambience of each room. For example, a selected lighting serves a particular purpose for the bedroom that may not work for the bathroom or kitchen. If you are decorating or want to improve the look of your home, you should explore your interior lighting design options. Like any aspect of home design, lighting design covers a wide range of styles. For this reason, you need to keep up with the latest interior lighting design trends. The rustic feel of the retro and industrial designs is returning to style. Unlike the traditional industrial look, modern industrial lighting includes smooth metals, a variety of tones and art-like design forms. Think of an industrial look but with class and elegance. This type of lighting design fits perfectly in the kitchen work area, above the dining table or as a wall lighting. It can also be used as a decoration on the wall or a centerpiece. Soft colors such as grey, a blend of both grey and beige, and soft gold (between brushed silver and gold) are popular in homes. These light color tones work well in any kind of decor whether its modern urban or farmhouse. There are many styles and designs of soft gold lighting fixtures that can enhance a room or a specific area of a room. You can also use these fixtures to blend with other soft colors. Art Deco and Mid-century modern design are also coming back into style. Art deco includes sharp lines and geometric designs while mid-century modern design emphasizes natural shapes. With a combination of both designs, these consist of clean lines, unique designs and a balance of form and art. The famous sputnik chandelier is an example of mid-century modern design and a geometric, long, shiny wall sconce is an example of art deco. Use overhead Art Deco fixtures to provide a strong presence of geometric design and use mid-century lighting for an informal slightly artful feel to a room. Vintage Edison-Style bulbs give a warmer retro style. 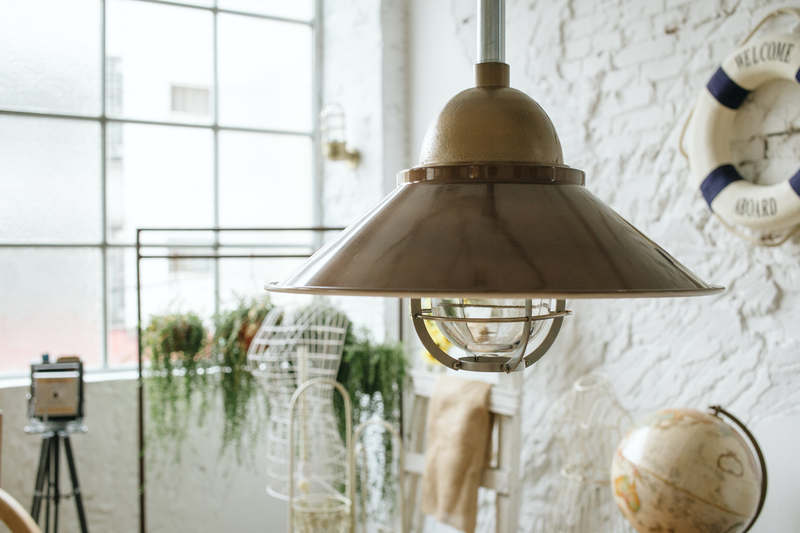 The bulbs have a rounded cone shape that give a cozy-home feeling and are perfect for the kitchen and the living room. You can either get incandescent Edison bulbs or Edison-style bulbs in modern LED lighting. If you are looking for a soft element of the retro look, Edison-Style bulbs are the way to go. However, it is recommended to use a system of lights such as a chandelier with this type of bulbs or a row of connected lights above an area in the kitchen or living room. In today's modern society, less accessories and open, clean space is in and added accessories are no longer preferred. Homeowners look for modern, simple, minimalistic, uncluttered interior design. Decorate your home with fixtures with simple geometric designs and soft colors. You can use these in any room whether it's in the kitchen as an overhead or in a study room as a reading lamp. However, do not overcrowd it with other fixtures; let it stand out on its own. This creates simplicity yet boldness. Incandescent bulbs are being replaced with LED bulbs. LED lighting is a more efficient, long-term cost-saving option. It also saves on energy and is eco-friendly. LED lighting is available in different styles and LED lamps come in a variety of colors, shapes and brightness so you can decorate your home with a unique style. Homeowners love bigger fixtures, as they draw attention to a room. They are great as centerpieces, such as a large pendant lighting fixture over a kitchen island or dining table;They are also used outside along footpaths. The best way to use bigger fixtures is to place it in the central area of a room and use smaller fixtures around the room to balance out the overall look. These decorating and design tips will help you create style in your home as well as a balance between design and lighting. However, use the design style of your preference and incorporate any of these designs if they work well in your home. In general, this will help you get an idea of how you can use the modern-day technology trends to decorate your home. At Cocoweb we offer a variety of lighting options to illuminate your home. We have floor and table lamps, piano lamps, outdoor lights, picture lights, art lamps, in addition to others. Contact us today or take a look at our online store at https://www.cocoweb.com/.